The clever patented design of this laptop stand is ultimately what gives it our top spot, but we also have to mention how good it looks, too. Made to match Apple products, it’s a handsome companion for the MacBook Pro or MacBook Air. The top surface features rubber pads to keep the brushed metal outer of the laptop from getting scratched, and the 360-degree swivel base makes adjusting your position or working (or shopping, or booking a holiday) with a partner easier. The aperture at the back also allows any cables to be neatly organised, so there’s no compromise on aesthetics if you keep your laptop set up at all times. On first glance, this folding laptop stand looks rather odd with its almost anthropomorphic legs, but personally, we dig the borderline industrial design, and the practical applications for its quirky looks couldn’t be more useful. 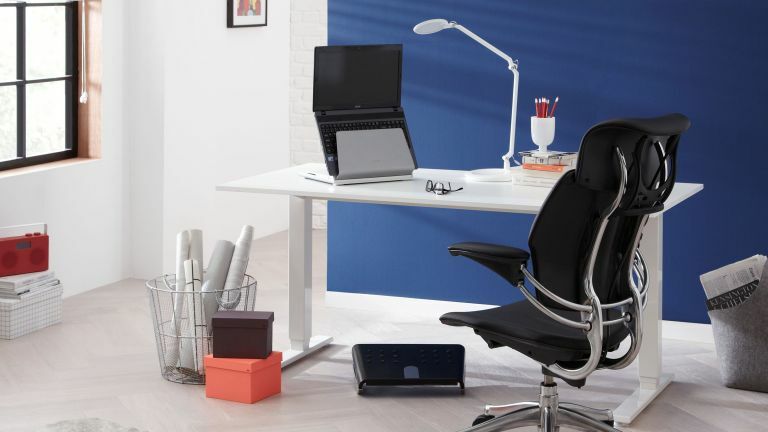 This phenomenally adjustable laptop stand makes our list for precisely that reason, it can be bent and tilted any which way to suit your sitting position, adaptable to desktop, coffee-table-top or even lying down on the sofa. Whichever way you prefer to work, the in-built cooling pad is sure to be an appreciated touch. If you’re in the market for a laptop stand but don’t have the space to have it as a permanent desktop fixture, or simply don’t like the look of having a stand out at all times, why not go for one that can be stored in a drawer until it’s needed? This x-shaped laptop stand is bare-bones, but very clever and attractive in its simplicity – the open design means that lots of airflow to the bottom of the laptop is a given, and the two little rubber feet at the back create the perfect angle for typing as well as optimum eye level. It’s so small and lightweight, it also has the unique distinction of being the only stand on our list you could conceivably take away with you for business travel, with its fold-flat design. While our previous choice, the cooling x-stand, gives laptop fans room to cool off with its minimal design, there is an alternative if you want something a bit more permanent or sturdier-sounding. This Trust Azul laptop stand has a pretty straightforward solid design that holds your laptop in optimum position for comfortable use. Cleverly built into the body are dual USB-powered fans which circulate air to the bits of the laptop that need it most. It runs the risk of looking a little bulky and industrial in a home office, but its blue-lit fans are rather attractive when in use and the integrated cable storage keeps things tidy. While far from the most portable option on our list, this BDI laptop desk is still a more movable improvement on the traditional computer desk. If you don’t have a dedicated office space where you can keep your laptop on its stand, this standing desk-meets-accent table is a clever alternative. In powder-coated steel, it’s durable enough to live outdoors as well as indoors, so if you’re lucky enough to often find yourself able to work outside, this might be a more attractive idea than hauling a tabletop laptop stand about.